See my art on Instagram! The stock of exclusive Sarka-Navon Design T-shirts are presently sold out but new Gary Montalbano designs along with reprints of the original designs are on the way. We are planing to have the store operational soon. Either like Gary’s Art Page on Facebook, “Friend” Gary on Facebook or sign up for his RSS feed and you’ll know the instant it opens. Gary is also available to do commission art work. 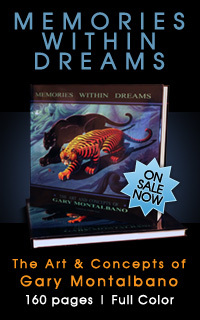 Please Contact us if you have any questions or if you would like to purchase any of Gary Montalbano’s Books, Art Prints or T-shirts from us directly before the official store opens. Wishing you the best and thank you for stopping by.